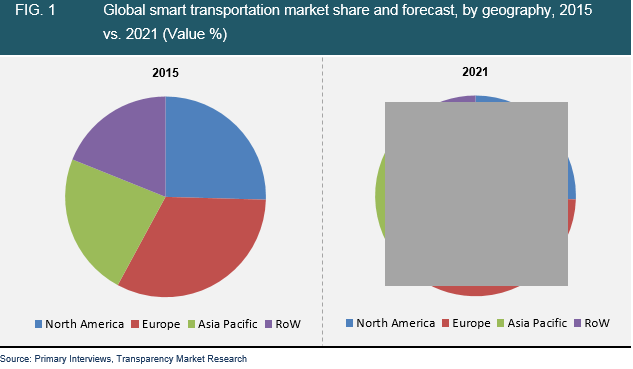 According to a new market study published by Transparency Market Research (TMR), the global smart transportation market will develop at a remarkable 18.50% CAGR from 2015 to 2021. If the projected figure holds true, the market, which had a valuation of US$45.1 bn in 2014, will be worth US$176.5 bn in 2021. The report is titled “Smart Transportation Market - Global Industry Analysis, Size, Share, Growth, Trends and Forecast 2015 - 2021” and is available for sale on the company website. According to the report, the market for smart transportation will exhibit phenomenal growth during the forecast period. In countries across the world, the increasing volume of sales of automobiles has led to acute traffic congestion problems that need to be addressed urgently. In addition, high traffic volume also poses a hazard to the safety of drivers, which can be concurrently addressed with the use of effective transportation solutions. Thus, the deployment of smart transportation is the formidable solution that serves the safety needs of the times. In this context, several governments in the world, such as the U.K. government, are devising programs for the implementation of smart transportation on roadway networks. The use of smart transportation systems is beneficial in large parking lots as well, for both parking management for the best usability of the space and for drivers to locate their parked vehicles without any hassle.Furthermore, the emerging idea to develop smart cities will open opportunities for the smart transportation market. However, the high cost involved in the installation of smart transportation systems is limiting the growth of this market. Moreover, the use of these systems requires internet connectivity and an exhaustive road network database, which is not in place at all locations in developing nations. The smart transportation market is divided on the basis of solution, service, and geography. By solution, ticketing management systems, integrated supervisory systems, parking management systems, and traffic management systems are the segments of the smart transportation market. Of these, in 2014, traffic management systems were recorded as the largest segment and contributed US$16.1 bn to the market. The segment is expected to continue its dominance in the forecast period due to the urgent need to reduce traffic congestions and to implement efficient solutions for freight management and toll gateways. In terms of services, in 2014, cloud services dominated the market, contributing US$19.4 bn to the revenue in the overall smart transportation market. Increasing use of remote data with the use of cloud networks for better transportation control is driving the cloud services segment of the smart transportation system market. Cloud services will also be the fastest growing segment and will display an impressive 18.70% CAGR in the forecast period. Among the regional markets, Europe currently leads the smart transportation market and the region is expected to retain its dominance during the forecast period. The high market share of the region is attributed to government-stipulated reformed traffic regulations that mandate the use of smart transportation solutions. Furthermore, the presence of large smart transportation solution companies such as Siemens AG and Alstom SA is contributing to the growth of the Europe smart transportation market.